Fumio Kishida, Japan’s foreign minister, places a wreath at the Go For Broke Monument on Friday. From left, Toke Yoshihashi, Mas Takahashi and James Ogawa represented the Japanese American military units of World War II. 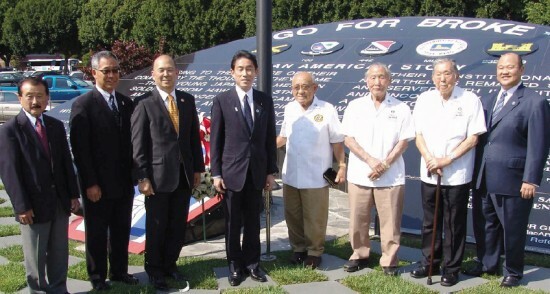 Japanese Minister for Foreign Affairs Fumio Kishida visited the Go For Broke Monument in Little Tokyo on May 3 during a one-day trip to Los Angeles that reinforced Japan’s ties with the Southern California Japanese American community. 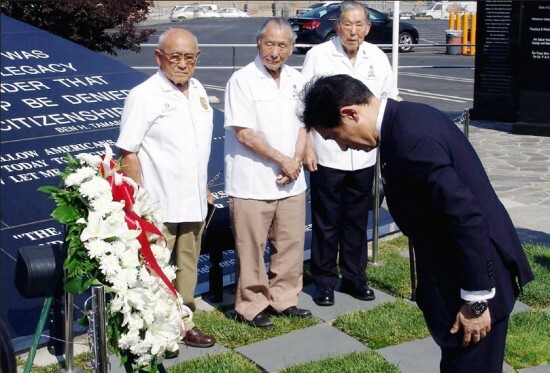 Kishida laid a wreath at the monument, which honors the more than 16,000 Americans of Japanese ancestry who fought bravely and overcame great obstacles to serve with distinction in the U.S. armed forces during World War II. These veterans were awarded the Congressional Gold Medal for their service in November 2011. Veterans James Ogawa, Mas Takahashi and Toke Yoshihashi, and Go For Broke National Education Center Chairman Bill Seki greeted the foreign minister at the wreath-laying ceremony and presented him with a replica of the Congressional Gold Medal. The ceremony capped a visit to the historic core of Little Tokyo that included stops at the Japanese American Cultural and Community Center and the Japanese American National Museum, where Kishida toured exhibits and viewed a memorial exhibition to the late Sen. Daniel Inouye. He also had the opportunity to view the Congressional Gold Medal, which is currently on a national tour through the Smithsonian Institution and on display at the museum from May 4 through June 9. Kishida toured some of the historic shopping areas of Little Tokyo on foot, and held a lunch meeting with representatives of the Japanese American community for an opinion exchange. He also met with residents at Keiro Retirement Home, an independent living center for Japanese American seniors. The visit reaffirmed the long-standing friendship between Japan and Los Angeles, which is home to the largest overseas community of persons of Japanese descent — currently more than 180,000 — and is an important base of operations for many Japanese companies. The visit came as a stopover following a tour of Mexico, Peru and Panama aimed at strengthening Japan’s relationship with those Latin American countries. From left, George Nakano, Don Nose, Bill Seki, Minister Kishida, Yoshihashi, Takahashi, Ogawa and Steven Kagawa.